2016 Marks our 70th Anniversary! This year we celebrate our 70th anniversary, a milestone that brings together generations of passionate European federalists who, since the end of World War II, have been campaigning for a united and federal Europe. Throughout the years we have been a leading voice in the promotion of European unity and an early campaigner for key milestones in the development of the European Communities and then the European Union. Today our struggle continues towards the ultimate goal - a European federation. The UEF XXV European Congress marks the beginning of a seven-month celebratory period, culminating in December 2016 with a final event in Paris, the city where the movement was founded. Many more events along the way will honour the anniversary year. Here, you will find out everything you need to know to participate in all the anniversary events and activities. Follow #UEF70 on our social media channels to stay tuned! EXHIBITION "70 YEARS OF CAMPAIGNS FOR A UNITED AND FEDERAL EUROPE"
To kick off the celebrations we have put together an exhibition and booklet entitled “70 Years of Federalist Campaigns for a United and Federal Europe exploring the history of European federalism. The exhibition was launched at the XXV UEF European Congress in Strasbourg on 10 - 12 June 2016. With a mixture of historical documents, photographs and posters, the story of European federalism is revealed decade-by-decade from its beginnings shortly after the war right up to the present day. Pictures of early campaigns and historical moments, from the first ‘euro’ coin and the frontier actions on the Franco German border in the 1960s to the march of 100,000 people through the streets of Milan in 1985, are combined with a narrative account of the history of our remarkable citizens’ movement. A booklet demonstrates how the European federalist movement has played an active role in calling for the most important developments and achievements throughout the history of the European project. Take a journey through seven decades of federalist ideas, campaigns and demonstrations! Download an electronic version of the booklet here. 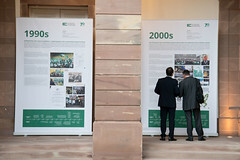 The European Federalists' timeline traces our achievements, campaigns, biggest demonstrations and meetings! Travel through the time and learn federalists' history with the help of stories, pictures and videos.